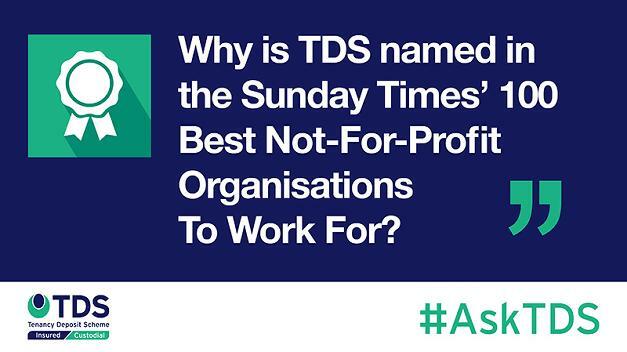 The Dispute Service, which operates the Tenancy Deposit Scheme (TDS), is incredibly proud to announce that we have secured 63rd place in the coveted Sunday Times 100 Best not-for-profit organisations to work for in 2019. This prestigious award is a culmination of our colleagues’ hard work and determination. Compiled by Best Companies, the top 100 rated companies in each category enter the prestigious Sunday Times lists. Companies are judged on eight factors of workplace engagement: Giving Something Back, My Manager, Leadership, My Company, Personal Growth, My Team, Wellbeing, Fair Deal. Each of our colleagues are aware of the positive attitudes that we aim to develop across the whole company in the aim of maintaining TDS’ position as the leading tenancy deposit scheme in the UK. As a not-for-profit, we believe strongly in reinvesting in the company, our services to landlords, agents and tenants, our colleagues, and the wider community. We are continuing to invest in continuous improvement of our team and the service we provide our customers.